The Authority has procured master service agreements for ecycling services for our jurisdictions. Under the master service agreements, the contractor is responsible for picking up the electronics that are collected by the jurisdictions, typically at their landfill or transfer station, and transporting the material to the contractor’s processing site. 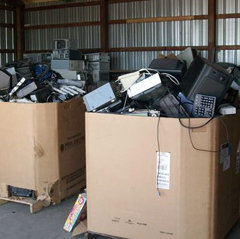 Currently, the Authority has contracts with Vintage Tech Recyclers and CyclePoint from SourceAmerica (using the R3 Services division of New Horizons Supported Services, Inc.) under the master service agreement.